Question : When are the next course dates? But we also recommend you join the mailing list. Look for or click this SUBSCRIBE button! Question : How do I book? Answer : Usually you would decide which course you want to do and email us at: bookings (at) learnxhosa (dot) co (dot) za. Sending us your cellphone number as well. We would then send you booking info based on availability. 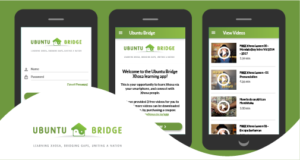 However, because UBuntu Bridge has recently transitioned into a non-profit company and have begun investing in developing our new business model. We will not be responding to emails personally from mid-June – September 2014. If you wish to confirm your place in at upcoming course at Montebello in Newlands, Cape Town, please email waitinglist (at) learnxhosa (dot) co (dot) za with the subject line: “I am interested in Level 1 October evenings” or “I am interested in Level 2 November evenings.” We will then make contact in September 2014 where you will get all the details. 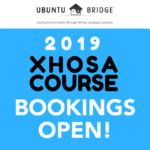 You can also take a look here: http://www.learnxhosa.co.za/courses/xhosa-public-classes/ for the latest info or follow us on social media platforms, Facebook & Twitter to keep up to date with us. Thank you for understanding! Question : Which course should I do? What level am I at? Answer : See detailed CD/Course content here: http://www.learnxhosa.co.za/courses/overview/. Level 1 is designed for absolute beginners who know nothing. However, many people who did know those basics found it extremely useful to recover it and get a feel for the way in which our style of Xhosa teaching is structured. You can also email us and we will send you our level assessments to help gauge your level. Question : Am I going to be able to speak fluent Xhosa after the course? Answer : You will know how to confidently approach Xhosa people, greet, introduce yourself, be polite and respectful, communicate clearly your Xhosa speaking ability, ask for help, ask and answer some polite questions in various conversational contexts and finally to escape a conversation. What you put in is what you get out. Each CD gives you more and more conversational ability, but becoming fluent in a language depends on how much effort you put in to learning and how much time you spend practicing with mother tongue speakers. It is a journey. We know how to get you started and how to support you along the way. Question : After the course, will a person be able to speak Xhosa? 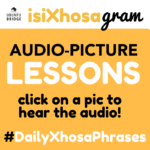 Answer : You will be speaking Xhosa during and from the first lesson. From there you keep learning. Question : And how long will it take me to speak the language fluently? Answer : Fluency is different depending on your effort to learn and your commitment to time spent just listening and practicing the language with people. You will get immediate results of great value within a couple of weeks (or even days), but fluency over a number of contexts and courses can take from a couple of months to a year to a couple of years, again depending on your efforts and circumstances. You will need dedication and patience. We give you the best (clear, humourous, multiplatform, mobile) materials to make it as easy for you as possible. Question : Are the phrases taught or are the basics explained first? I am not interested to learn phrases off by heart. I want to learn to understand the language. Answer : The Level 1 course does provide a grammatical understanding of the language, in an empowering way. However, one will go more in-depth with the language rules etc in Levels 2 and beyond. 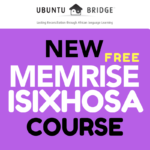 You can read more about the details of the isiXhosa Level 1, 2 and 3 course content on our website here: http://www.learnxhosa.co.za/courses/overview/. It’s definitely not parrot learning of phrases. Question: I am an advanced learner and wish to sign up for a Level 3 Xhosa Course? When are these courses? 3. You can also feel free to post to our Facebook wall, looking for other learners and form a study group to work through our Level 3 materials together, and perhaps go on volunteer outings as a group for more practice. Will there be any level 2 classes running in July this year? I’m a medical student and have already learnt some very basic isiXhosa. Currently living in George and will only be in Cape Town for July. Will keep you updated, Sarah!